How to Cite This Chapter: Haider S, Roliński J, Sacha T. Febrile Neutropenia. McMaster Textbook of Internal Medicine. Kraków: Medycyna Praktyczna. https://empendium.com/mcmtextbook/chapter/B31.II.22.2.5 Accessed April 24, 2019. Averbuch D, Orasch C, Cordonnier C, et al; ECIL4, a joint venture of EBMT, EORTC, ICHS, ESGICH/ESCMID and ELN. 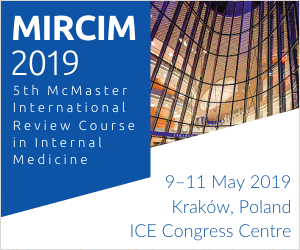 European guidelines for empirical antibacterial therapy for febrile neutropenic patients in the era of growing resistance: summary of the 2011 4th European Conference on Infections in Leukemia. Haematologica. 2013 Dec;98(12):1826-35. doi: 10.3324/haematol.2013.091025. Erratum in: Haematologica. 2014 Feb;99(2):400. PubMed PMID: 24323983; PubMed Central PMCID: PMC3856957. Freifeld AG, Bow EJ, Sepkowitz KA, et al; Infectious Diseases Society of America. Clinical practice guideline for the use of antimicrobial agents in neutropenic patients with cancer: 2010 update by the infectious diseases society of America. Clin Infect Dis. 2011 Feb 15;52(4):e56-93. doi: 10.1093/cid/cir073. PubMed PMID: 21258094. Aapro MS, Bohlius J, Cameron DA, et al; European Organisation for Research and Treatment of Cancer. 2010 update of EORTC guidelines for the use of granulocyte-colony stimulating factor to reduce the incidence of chemotherapy-induced febrile neutropenia in adult patients with lymphoproliferative disorders and solid tumours. Eur J Cancer. 2011 Jan;47(1):8-32. doi: 10.1016/j.ejca.2010.10.013. PubMed PMID: 21095116. Neutropenia is the most common hematologic complication of cancer treatment. It may result from the myelotoxic effects of chemotherapy or radiation therapy or from bone marrow infiltration by malignant cells. In patients with febrile neutropenia the causative pathogen can be identified only in 20% to 30% of cases. Prior to the introduction of empiric therapy for febrile neutropenia, the most frequently identified etiologic agents were Pseudomonas spp and Enterobacteriaceae (eg, Escherichia coli, Klebsiella spp) followed by gram-positive cocci (most commonly Staphylococcus aureus). In the era of empiric therapy, there has been a shift in the microbiology of pathogens to predominantly gram-positive organisms (coagulase-negative staphylococci being the most common) followed by Enterobacteriaceae and then by nonfermenting gram-negative bacilli, such as Pseudomonas aeruginosa. 2) Absolute neutrophil count (ANC) <500/microL or an expected decrease in ANC <500/microL within 48 hours. 1) High risk: Expected long-term (>7 days) and profound neutropenia (ANC ≤100/microL) and/or clinically significant complications. 2) Low risk: All other patients. 2. Collect at least 2 separate specimens for blood culturing, every time from each lumen of a central vascular catheter, peripheral vein, and from other sites, depending on the suspected etiology (see Peripheral Venous Blood Sampling). 1) Hemodynamic instability or other signs of severe sepsis. 3) Cultures positive for gram-positive bacteria (prior to the definitive identification of the causative pathogen and obtaining drug susceptibility test results). 4) Clinical suspicion of a severe vascular catheter-associated infection (eg, chills during an infusion via the catheter or signs of infection in the area adjacent to the catheter). 5) Skin or soft tissue infection. 6) Documented colonization by methicillin-resistant S aureus (MRSA) or penicillin-resistant pneumococci. 7) Severe mucositis in patients who received prophylactic fluoroquinolones and their current empiric therapy includes ceftazidime. 1) MRSA: Vancomycin, linezolid, or daptomycin. 2) Vancomycin-intermediate S aureus (VISA): Linezolid, tigecycline, daptomycin, quinupristin/dalfopristin. 3) Vancomycin-resistant enterococci (VRE): Linezolid, tigecycline, daptomycin, quinupristin/dalfopristin (Enterococcus faecium). 4) Extended-spectrum beta-lactamase (ESBL)–producing strains: Carbapenem. 5) Carbapenem-resistant Enterobacteriaceae strains: Colistin, tigecycline, or an aminoglycoside. 6) Carbapenemase-producing Klebsiella pneumoniae: Colistin or tigecycline. 7) Beta-lactamase–resistant P aeruginosa: Colistin or aminoglycosides. 8) Beta-lactamase–resistant Acinetobacter spp: Colistin or tigecycline. 9) Stenotrophomonas maltophilia: Sulfamethoxazole/trimethoprim, fluoroquinolones (ciprofloxacin, moxifloxacin), ticarcillin/clavulanate. Patients in whom the etiologic agent responsible for the infection has been identified should receive a targeted therapy. However, it is recommended that empiric febrile neutropenia coverage be maintained until the resolution of fever and neutrophil recovery (ANC >500/microL). Between days 2 through 4 of empiric antibiotic therapy reevaluate the patient: Figure 2. Patients with persistent neutropenia who have completed a course of antibiotics should stay in the hospital for an observation lasting ≥24 to 48 hours. 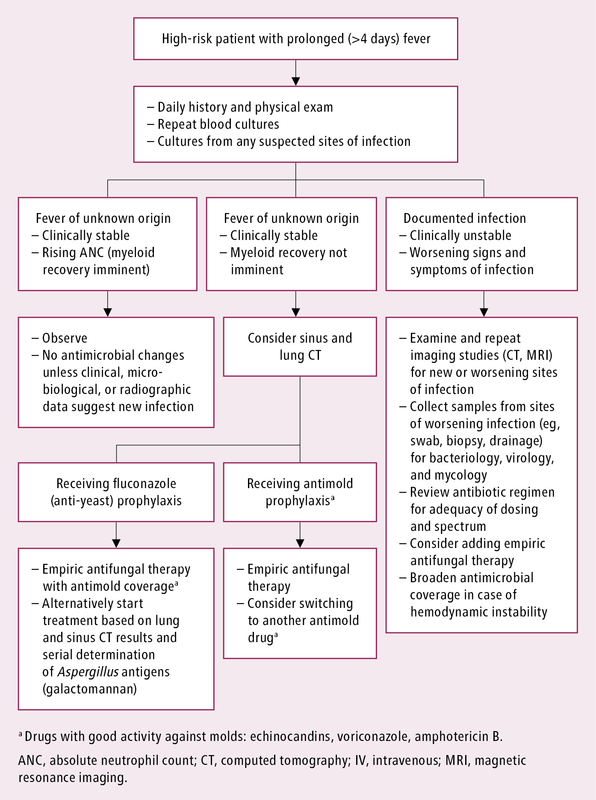 Management of high-risk patients with fever persisting for >4 days of empiric antibiotic therapy should include either the addition of empiric antifungal therapy or preemptive therapy (therapy as directed by testing indicating the possibility of fungal infection [bronchoalveolar lavage, galactomannan, high-resolution computed tomography]) in selected patients: Figure 3.Evidence 1Strong recommendation (benefits clearly outweigh downsides; right action for all or almost all patients). Low Quality of Evidence (low confidence that we know true effects of the intervention). Quality of Evidence lowered due to the risk of bias and a small number of events. Note: Although this is considered standard of care, it is based on low quality of evidence with issues in the methodology, small sample size, and potential for bias in the assessment of fungal infection. There was a reduction in invasive fungal infections (relative risk, 0.25; 95% CI, 0.12-0.54; 5 randomized controlled trials with n=800) but no effect on all-cause mortality. Sensitivity analysis according to study quality and time of treatment commencement did not alter the finding; the number needed to treat to prevent one invasive fungal infection was 17, and control rate was 7.7%. Goldberg E, Gafter-Gvili A, Robenshtok E, Leibovici L, Paul M. Empirical antifungal therapy for patients with neutropenia and persistent fever: Systematic review and meta-analysis. Eur J Cancer. 2008 Oct;44(15):2192-203. doi: 10.1016/j.ejca.2008.06.040. Review. PubMed PMID: 18706808. 1) Follow universal precautions, particularly hand hygiene and cough etiquette (masks covering the face and nose), for all patients. Institute reverse isolation with laminar flow or high-efficiency particulate air (HEPA) filtration only for hematopoietic stem cell transplantation patients and those receiving standard therapy for acute leukemia or aplastic anemia. 2) Recommend a fluoroquinolone (ciprofloxacin or levofloxacin) or sulfamethoxazole/trimethoprim only in high-risk patients, defined as hematologic patients on standard chemotherapy, hematopoietic stem cell transplantation patients, and patients with solid tumors (breast, lung, ovary, germ cell tumors).Evidence 2Strong recommendation (benefits clearly outweigh downsides; right action for all or almost all patients). High Quality of Evidence (high confidence that we know true effects of the intervention). Gafter-Gvili A, Fraser A, Paul M, et al. Antibiotic prophylaxis for bacterial infections in afebrile neutropenic patients following chemotherapy. Cochrane Database Syst Rev. 2012 Jan 18;1:CD004386. doi: 10.1002/14651858.CD004386.pub3. Review. PubMed PMID: 22258955; PubMed Central PMCID: PMC4170789. 3) Recommend antifungal and antiviral agents only in patients undergoing allogeneic hematopoietic stem cell transplantation or induction or reinduction chemotherapy for acute myeloid leukemia.Evidence 3Strong recommendation (benefits clearly outweigh downsides; right action for all or almost all patients). High Quality of Evidence (high confidence that we know true effects of the intervention). Bow EJ, Laverdière M, Lussier N, Rotstein C, Cheang MS, Ioannou S. Antifungal prophylaxis for severely neutropenic chemotherapy recipients: a meta analysis of randomized-controlled clinical trials. Cancer. 2002 Jun 15;94(12):3230-46. PubMed PMID: 12115356. Cornely OA, Maertens J, Winston DJ, et al. Posaconazole vs. fluconazole or itraconazole prophylaxis in patients with neutropenia. N Engl J Med. 2007 Jan 25;356(4):348-59. PubMed PMID: 17251531. Gøtzsche PC, Johansen HK. Routine versus selective antifungal administration for control of fungal infections in patients with cancer. Cochrane Database Syst Rev. 2014 Sep 4;(9):CD000026. doi: 10.1002/14651858.CD000026.pub2. Review. PubMed PMID: 25188768. 4) Recommend sulfamethoxazole/trimethoprim in patients with risk factors for Pneumocystis jiroveci infection, for instance, in the course of glucocorticoid therapy lasting ≥1 month or therapy with purine analogues and allogeneic transplant recipients after engraftment. 5) Consider granulocyte colony-stimulating factor or granulocyte and macrophage colony-stimulating factor in patients with prolonged bacteremia and confirmed infections. 6) Avoid prolonged contacts with environment contaminated with fungal spores (eg, large-scale construction/renovation works). Source: Klastersky J, Paesmans M, Rubenstein EB, et al. The Multinational Association for Supportive Care in Cancer risk index: A multinational scoring system for identifying low-risk febrile neutropenic cancer patients. J Clin Oncol. 2000 Aug;18(16):3038-51. COPD, chronic obstructive pulmonary disease; MASCC, Multinational Association of Supportive Care in Cancer. Figure 1. Initial management of patients with fever and neutropenia. Adapted from the 2011 Infectious Diseases Society of America guidelines (see Additional Information for details). Figure 2. Reassessment of patients with febrile neutropenia after 2 to 4 days of empiric antibiotic therapy. Adapted from the 2011 Infectious Diseases Society of America guidelines (see Additional Information for details). Figure 3. Management of high-risk patients with fever after 4 days of antibiotic therapy. Adapted from the 2011 Infectious Diseases Society of America guidelines (see Additional Information for details).